The New England Patriots and Philadelphia Eagles are the AFC and NFC Champions, respectively. 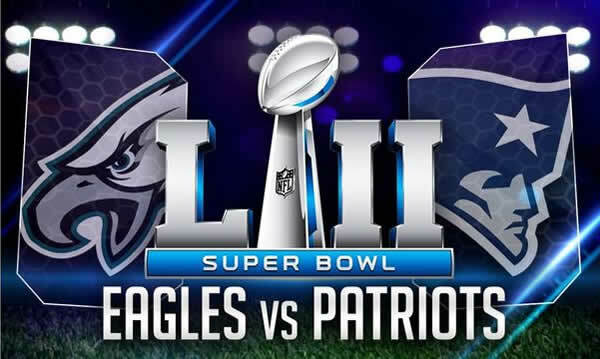 This year’s season has had its ups-and-downs in terms of injuries, controversies, underdog stories and more, but it all comes down to Super Bowl LII between these 2 forces. If you look back at Conference Championship weekend, there are several key things to take out of it. From a legal online betting standpoint, these elements could play a factor in how you bet on the Super Bowl. For starters, New England barely escaped Jacksonville in the AFC Championship. The Pats are not often down in games, but they have proven on several occasions that they have what it takes to mount a comeback. They showed us in Super Bowl LI against the Falcons and again in this year’s AFC Championship against the Jaguars. While the Patriots were able to hold up the trophy at the end of this game, there are several things that need to be addressed. QB Tom Brady reportedly had 12 stitches put in his throwing hand in the days leading up to the game. Brady, the oldest QB to start a Conference Championship game, has shown his quality over an illustrious career and will undoubtedly be in the Hall of Fame. Still, he is not invincible. When the news of his injury broke, some believed that QB Brian Hoyer would get the start. The Pats had a fine-tuned second-stringer in Jimmy Garoppolo, but he was forced out of New England to appease Brady and his starting role. Pats fans were the most nervous, but most saw this as some sort of signature Bill Belichick distraction tactic. In any case, Brady got the start and threw for 290 yards and 2 touchdowns. However, fans must be wondering if these stitches will affect his Super Bowl performance. Not likely, since the wound was fresher in the AFC game and he still managed to pull out a win, but something to note. Another thing to note is Rob Gronkowski’s concussion. Gronk was on the end of a nasty hit from the Jaguars defense that saw him take an early exit. Lucky for Gronk, he has an extra week to get his head right for the Super Bowl. He still has to be passed by an independent neurologist, but the Pats’ staff is confident he’ll play. Things we saw in the AFC game—Danny Amendola stepped up to the plate. With Edelman and Gronk both out, it was up to the lesser known receiving corps to make a play. Brandin Cooks, Danny Amendola and Chris Hogan are the top 3 guys, and Amendola made sure to leave his mark on the AFC Championship with 2 touchdowns and several other significant plays. Jacksonville looked to be in control for the first half, but they seemed to back off a bit. This is something you do not do against the postseason Patriots ever, just ask Matt Ryan. QB Blake Bortles had a great game without any turnovers, but the Jags’ short-burst offense didn’t seem to make anything happen in the closing minutes of the game. The Jags will be back next year if they can retain their roster, but New England showed the benefit of having Playoff experience when it mattered most. The NFC Championship game saw the Eagles fly over the Vikings like they weren’t even there. Vikings QB Case Keenum’s positive run seemed to finally hit some snags, as he threw 2 picks—one of which a pick-6—on his 28-48 night for 271 yards. Their run game was shut down by the Eagles defense, leaving the Vikings to revert to passing. Outside of the interceptions, Keenum had a decent outing in hitting several different receivers, but the Eagles corners had the backfield covered for most of the game. On the winning side of things, the Eagles looked great. Their defense was stout and held Minnesota to only 7 points. RBs Jay Ajayi and LeGarrette Blount had positive games 94 yards and a touchdown between the 2 of them. Their receiving corps performed well with Zach Ertz, Alshon Jeffery, Torrey Smith and Nelson Agholor all having great games. QB Nick Foles went for 352 passing yards and 3 touchdowns—not too shabby for a player on the outside of most people’s expectations for years. Both the Pats and Eagles will need to bring their best defensive effort to Super Bowl LII. If the Eagles’ defense can perform as well as they have in the Divisional Round and NFC Championship, they may be able to stifle Brandy. Foles will need to bring his A game as well. The Pats need to get on the board early and not work from behind for once, but for some reason they seem to thrive off the pressure. If you’re looking for football betting, the Pats are favored in most sportsbooks, but the Eagles have been the underdogs in each of their postseason games and haven’t lost yet.